wondefully surreal and cartoony, bob! love your colors and the sense of humor is hilarious. i can't wait for the next installment! 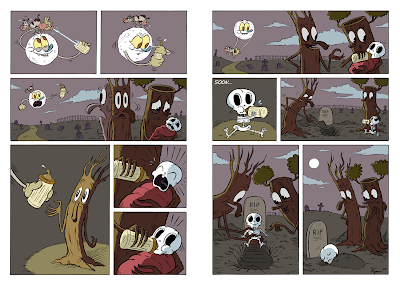 hurray heeby jeeby comix! Ha! Wow, this reads beautifully AND is hilarious. more, more, more! This is brilliant Bob. I love the fact that you told an entire story without the use of text (which isn't the easiest thing to do). I'm with Ryan...I want to see MORE! So that's why the cow jumped over the moon. Love the girl tree's ponytails, and of course all the emotions on the little ghoul baby and friends. I wonder if my daughter will be traumatized if i hang this in her room? probably not, she lives with us already. ; ) completely brilliant bob, love love love it!! Weird, but brilliant. I love this so much! That li'l baby Skeleton looks so cute! I love this - such a lovely tale in a creepy context. Haha, love panel 4 of the second spread. this is full of win. No text is WAAAY better than text. Thanks everyone! 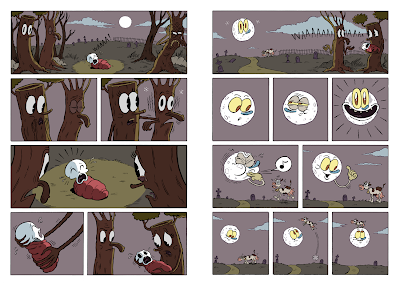 This comic was a lot fun to make, and I have my pals Chris and David to thank. It basically combines a lot of the things I aim to do. Tell a story without a lot of words, use some fun characters, sprinkle some color on top of the line, and weird people out a bit. I'm glad people have been digging the ending. I'll try to get a new one up soon. Just saw this ... so good, man! Art and story. Bravo!